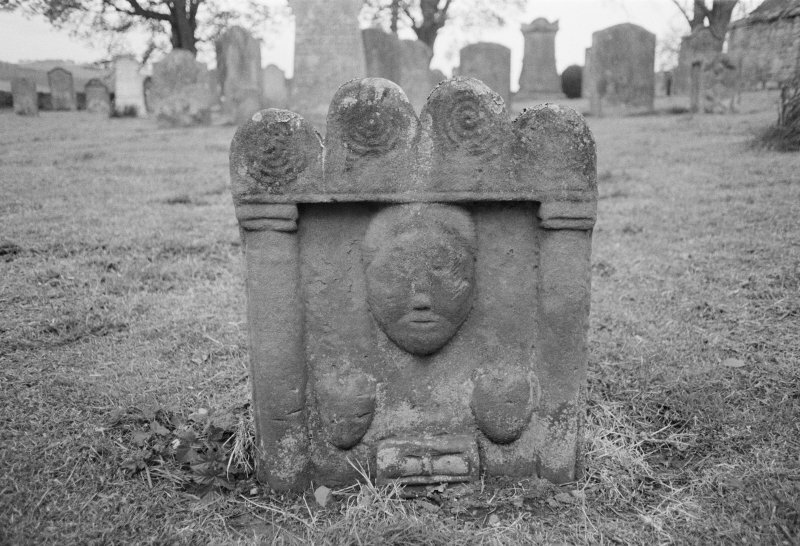 View of gravestone in the churchyard of Preston Old Parish Church. 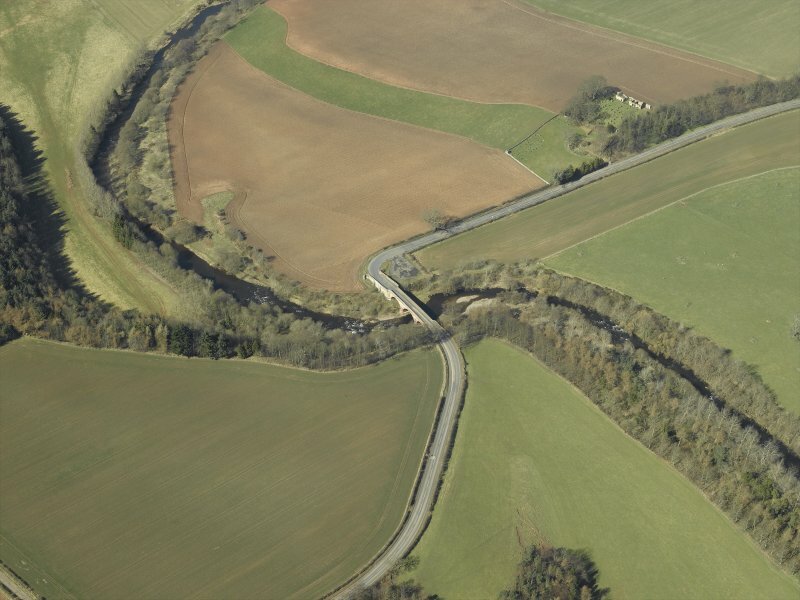 Oblique aerial view centred on the road bridge with the remains of the church and burial-ground adjacent, taken from the SE. Old Parish Church, Preston: There was probably a church here in the 12th century, although the present ruin shows evidence of extensive rebuilding and alteration in the medieval period and later. The church went out of use in 1718, when the parish of Preston was united with Bunkle. The structure consists of a nave and chancel of equal width, the whole internal dimensions being approximately 70ft by 14ft 6ins, with the chancel 18ft 6ins long. On the N side of the building there are slight traces of a 'lateral adjunct which may have been a sacristy' (J Robson 1896). RCAHMS 1980, visited 1979; I B Cowan 1967; RCAHMS 1915; Fasti Eccles Scot, H Scott et al ed. 1917; J Ferguson 1892; D MacGibbon and T Ross 1897. The gables and short stretches of the S wall are all that remain of the original Preston Church. The N wall has been rebuilt within recent times and the whole building shows signs of restoration. Visited by OS (RD), 12 August 1970. A change was made to the statutory list of buildings of special architectural or historic interest relating to the statutory address of this building. The change of statutory address excluded from the listing the area that was also a scheduled monument. This area will remain part of the scheduled monument SM5655, Preston Church, church and burial ground. Visibility: Unknown. The state of preservation of this structure or monument is unknown.